Marjoram is a herb associated with warmth, and it appears in mythology as being uplifted by Venus the sun. Historically it has been used as a stewing herb and in linen cupboards to keep houses and linen smelling sweet and clean. Marjoram is a somewhat cold-sensitive perennial herb or undershrub with sweet pine and citrus flavours. In some middle-eastern countries, Marjoram is synonymous with Oregano, and there the names Sweet Marjoram and Knotted Marjoram are used to distinguish it from other plants of the genus Origanum. Taste and Aroma:Marjoram is cultivated for its aromatic leaves, either green or dry, for culinary purposes; the tops are cut as the plants begin to flower and are dried slowly in the shade. It is often used in herb combinations such as Herbes de Provence and Za'atar. The flowering leaves and tops of Marjoram are steam distilled to produce an essential oil that is yellowish in color (darkening to brown as it ages). It has many chemical components, some of which are borneol, camphor and pinene. Majoram has a flavour not unlike basil, so can provide a more subtle substitute in any dish where basil is used. This includes tomato dishes, salads, omelettes, scones or dumplings, fish, chicken, green vegetables, egg, cheese and meat dishes. As with all herbs, it is really a matter of experimentation. 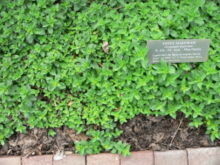 Medical uses:Although considered cold-sensitive, marjoram can sometimes prove hardy even in zone 5. Majoram can ease upset stomachs and stimulate digestion. Because of its 'warmth forces', majoram, or its close relative oregano, can cause quite profuse sweating and can effectively help to rid the body toxins. A symbol of happiness, majoram planted on graves is said to bring eternal peace to depart souls.